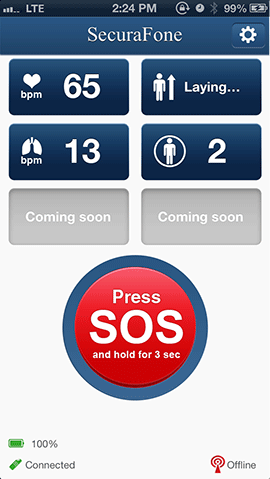 SecuraFone Health provides an easy-to-view and understand dashboard of your vitals as relayed by SecuraPatch. This view can also be seen remotely by caregivers, doctors or others who have been the rights to access this information. 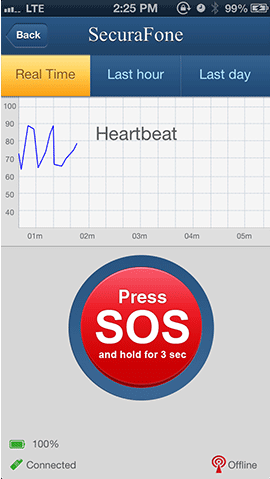 From this view the person with the app can also call for help to a 24/7 monitoring center, 911 or another person of their choice by pressing and holding the SOS button for 3 seconds. You can view historical information specific for each monitored vital by pressing on the desired icon. In this view you can see the information related to heart rate in real-time for up to 5 minutes, over the last hour or over the past 24 hour period. This information can also be reviewed remotely by caregivers, doctors or others who have been the rights to access this information. 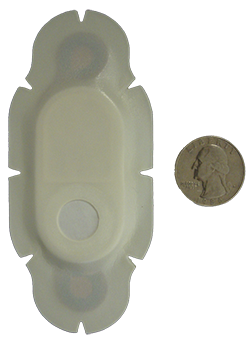 SecuraPatch™ is a wireless adhesive sensor built to monitor a broad range of vital signs and activity. SecuraPatch gathers and transmits data continuously to the “relay” (the SecuraFone mobile app) where the data is stored and analyzed or forwarded to the cloud for action or further analysis. Upon recognizing a pre-defined change of condition, a notification is sent to the wearer’s caregiving team (doctors, nurses, family members, friends, etc.). The caregiving team can configure the notification limits for each measurement from our secure portal, as well as how and to whom the notifications will be sent. The SecuraFone Health can also be configured to allow the caregiving team to access both real-time and historical data and to work with a 24/7 monitoring company that provides near-immediate emergency response to health and other events.